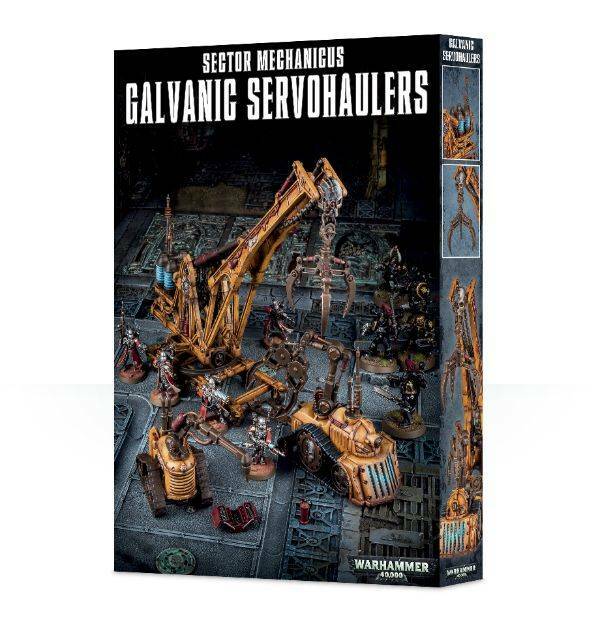 The 2 servohaulers themselves are remnants of ancient technology; little more than powerful engines with tracked wheels, they’re covered in iron plating, and feature a hydraulic crane and robotic arm – these pieces are interchangeable between the two. Both servohaulers feature Adeptus Mechanicus symbols and large, almost primitive exhaust systems – there’s nothing elegant here! The crane is a much taller machine, a skeletal frame of iron holding a chain, three-clawed grabber and winch with a large engine block and Adeptus Mechanicus symbols on the sides. The trailer that the crane fits upon can instead fit a Munitorum Armoured Container; this kit has been designed with an eye to mixing and matching components from that kit and creating your own obstacles and cover in industrial environments. Also included are a toolbox and fire extinguisher, because in the grim darkness of the far future safety is still a top concern. 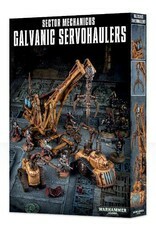 A scenario is included for using the Galvanic Servohaulers in games of Warhammer 40,000.